On Wednesday night September 4, 1968, promoter Ed Francis presented a Pier 9 Brawl wrestling card featuring Jim Hady and Ripper Collins wearing boxing gloves. In the opening match, Klondike Bill downed local boy and former Mr. Hawaii Dean Higuchi. 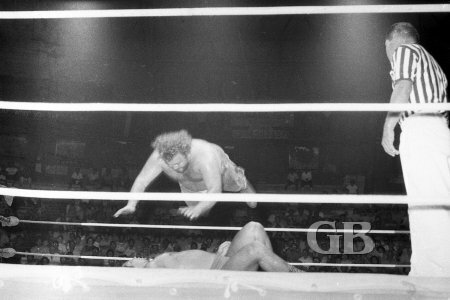 Klondike Bill about to "Splash" Higuchi. Higuchi runs into a stone wall of a body in Klondike Bill. In the next match, Chief Billy White Wolf defeated Maltese born Baron Scicluna. Cheif Billy White Wolf stands ready to deliver a double tomahawk chop to Baron Scicluna. The next match was a tag team battle between Johnny Barend with his long time partner the Magnificent Maurice against Curtis Iaukea and Neff Maiava. Barend and Maurice were once a championship team on the mainland. 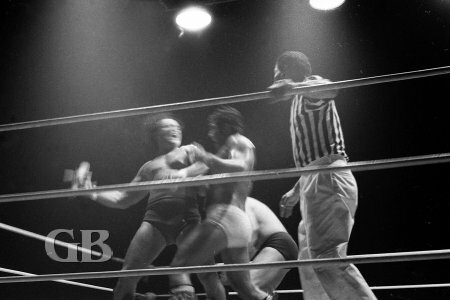 Iaukea and Maiava, fierce adversaries in the past, teamed up to go against Barend and Maurice. Barend with an arm bar on a downed Maiava. 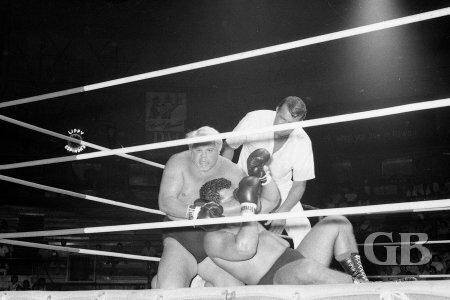 Neff Maiava stretches to tag Curtis Iaukea from the grips of Maurice's tight chinlock. 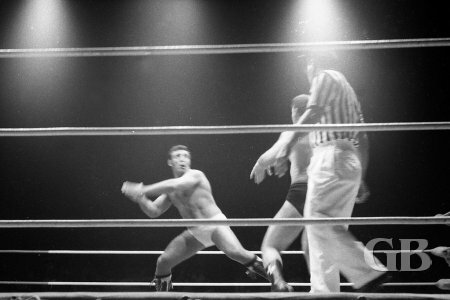 Maurice battles Maiava on the ring apron. 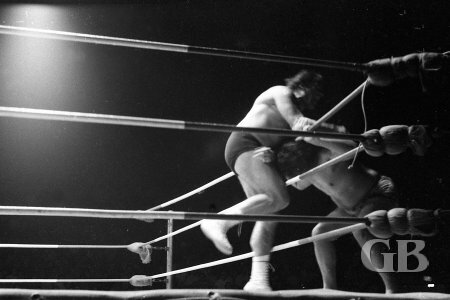 Billy White Wolf enters the ring to assist Maiava & Iaukea after the match. The main event of the night was a Pier 9 Brawl between Collins and Hady. Friday Allman and Chief Billy White Wolf served as seconds for Ripper Collins and Jim Hady respectively. The Brawl consisted of 15 two minute rounds with a rest period between each round. 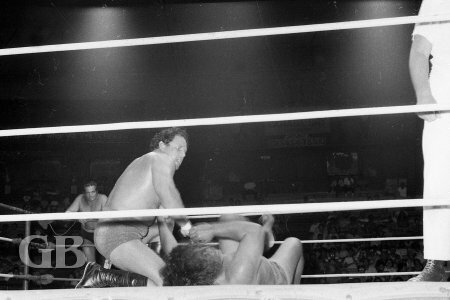 Billy White Wolf acts as Jim Hady's second as Friday Allman, Ripper Collins' second, looks on in the background. 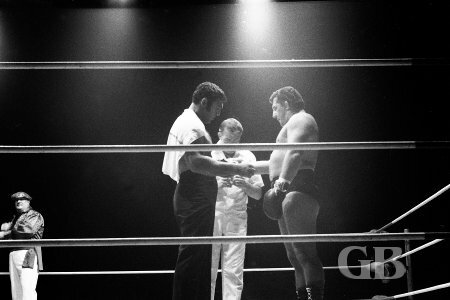 Ripper Collins and Jim Hady face off before referee Pete Peterson. Jim Hady takes a breather between rounds. 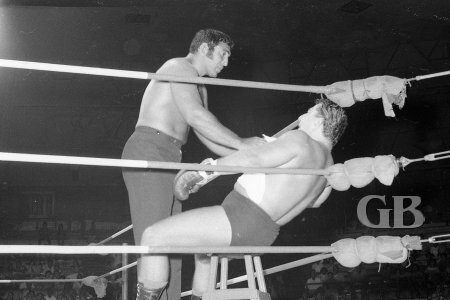 Collins tries to apply a headlock on Hady while wearing boxing gloves. 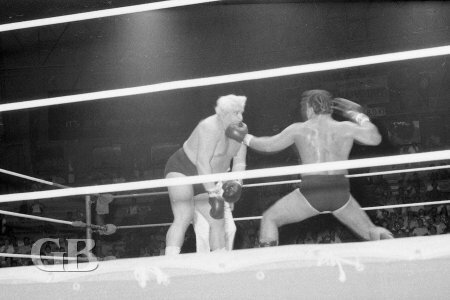 Jim Hady about to deliver a haymaker to Collins' face. 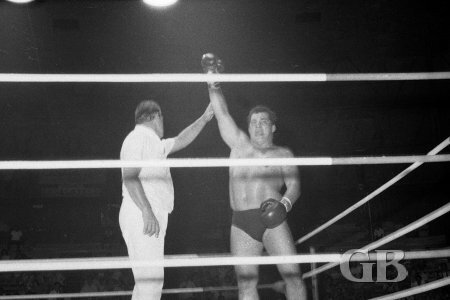 Jim Hady won the Pier 9 Brawl after knocking out Ripper Collins. 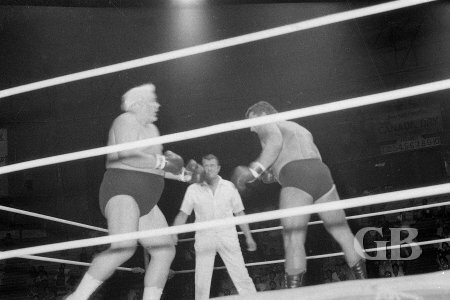 Jim Hady declared the winner of this Pier 9 Brawl. 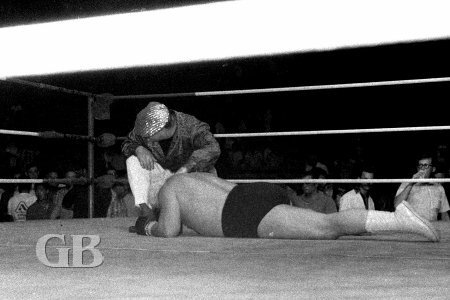 Friday Allman tends to a downed and defeated Ripper Collins.